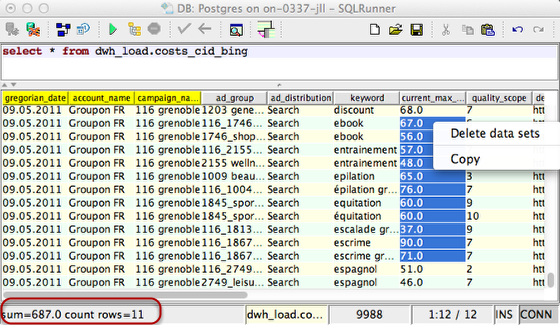 This is a real live example of a query collecting data in a very complex way. There is nothing to do, if the cursor hits a identifier (at the start, at the end or within) this word will be highlighted in the whole editor window. In a next version, you can decide hightlighting this in all other windows as well. All statements are separated by semikolon. If there are embedded procedure code starting like "create or replace procedure..." then separating by semikolon is suspended from start of the procedure code and waits until a slash appears mark the end of procedure code to start again with separating next statements. 1. Example of loading scripts. These scripts can use relative pathes to the current script. If there is no current script, you have to use absolute pathes. 2. 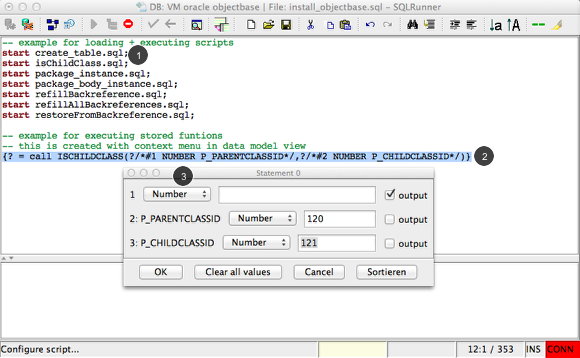 If you want run selected statements (also as script) the select the text and click on Run. You can run stored procedures and functions exactly in the way you need them embedded in you Java code. 3. 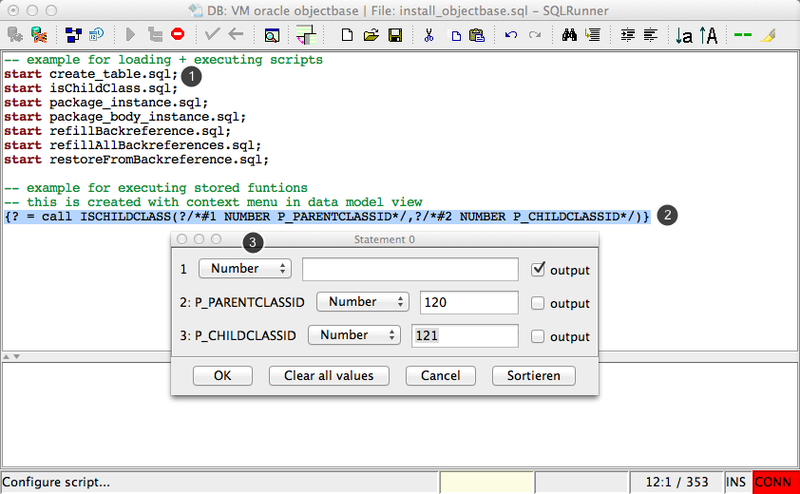 If there are parameteres ( or binding variables) an modal dialog will collect all values for parameters. 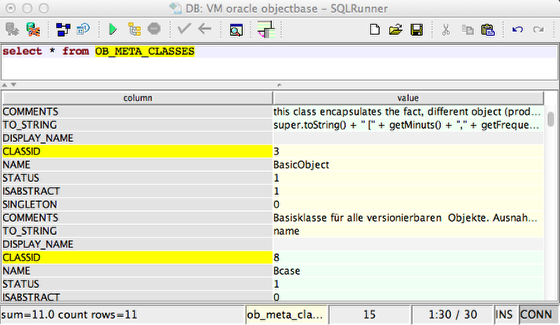 You can define a parameter as output. After running this statement, the result table will show the output parameter values. 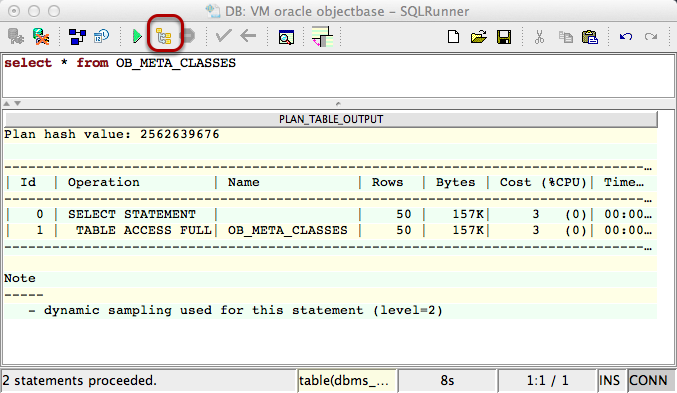 The button "Explain" as well as the menu entry Database->Explain is enabled if the database provides this feature and there is an mplementation in SQLRunner. A click on the button of menu "Explain" creates and shows the explain plan in the result table area. This works as well for selected text. 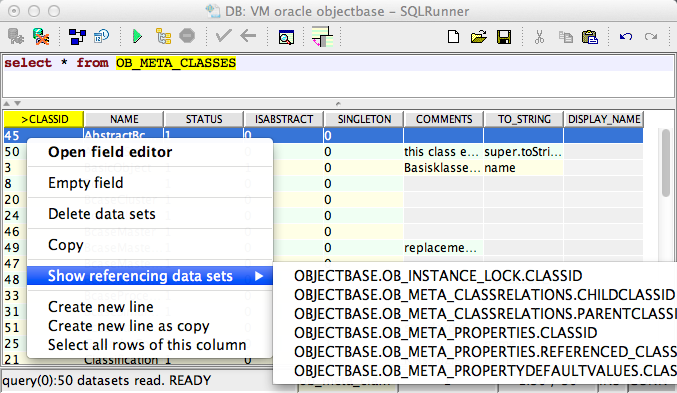 This feature is currently implemented for Oracle and PostgreSQL. 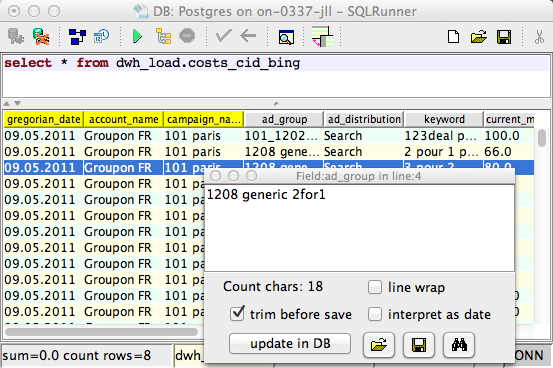 DB2 is work in progress. Double click or using context menu (Open value editor) brings up this dialog in order to edit the cell value. 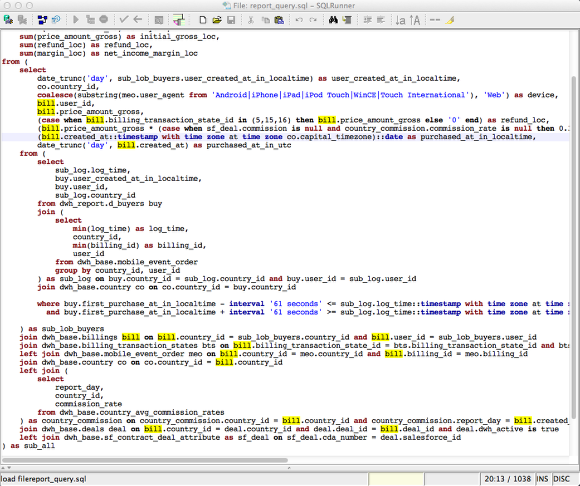 It is a editor in which also very large values can be edited (think about XML content in CLOB columns). 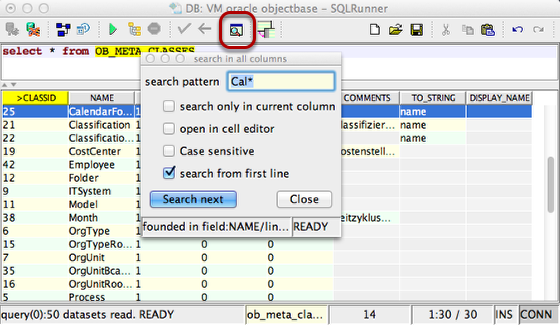 This editor has search and replace capabilities and can trim value before update. You can open multiple cell editors simultaneously. SQLRunner take care, that only one editor at once bound to the same cell. This context menu opens a new window (behaviour can changed in the preferences) with all dataset referencing to the selected cell. It is also possible to get a referenced dataset. In the tables header a greater-than shows that this column will be referenced and a greater-than after the column name shows you this cell reference an other dataset. Sometimes it is useful to have a larger view to the cell contents. In this view all rows and all columns all are rows. You can edit in this view as well! The last 1000 statements will be saved in the history per default. If a list contains important information and they need to saved as proof -> the history can be saved as SQL script with runtime informations as comment. 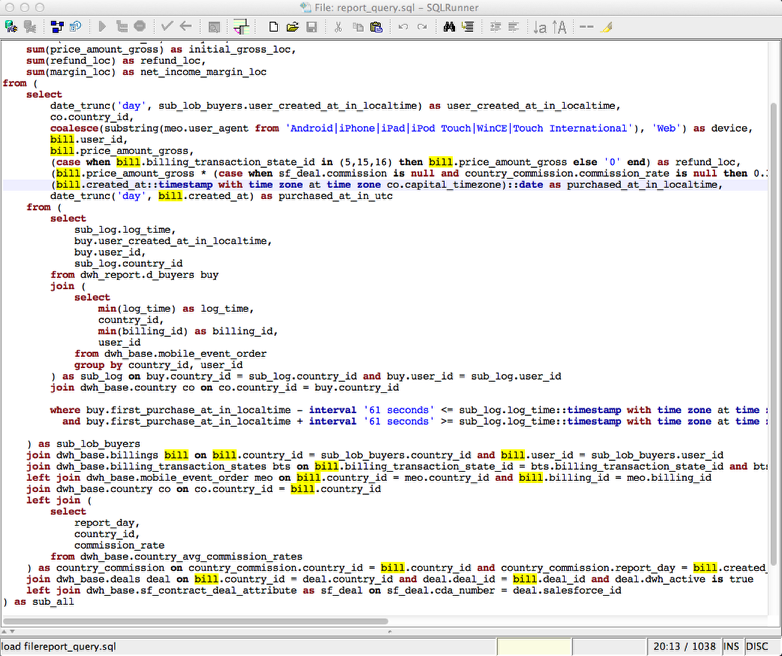 With the button "Accept" or simple hit enter you copy the current selected statement in the editor to further execution.